The global tobacco giant got some long-awaited help from an unexpected source. The tobacco industry has a challenging one, and Philip Morris International (NYSE:PM) has worked hard to do its best to maximize its sales and profits in all the areas it serves across the globe. Yet at the end of the day, Philip Morris has to collect all the money that it brings in around the world and then report to its shareholders how it has performed. That leaves the tobacco giant vulnerable to currency risk, and in recent years, weak foreign currencies have crushed Philip Morris' results. 2016 finally started to see those adverse impacts begin to diminish, and investors hope that the stock will respond favorably to disappearing currency-related headwinds in 2017 and beyond. Philip Morris International is almost unique in the sense that it gets every penny of its core revenue and earnings from outside the U.S. market. That's because of the way that it split up its territory with its former parent, taking custody of the international arena and leaving domestic tobacco in the hands of the Philip Morris USA unit of Altria. At the time of the spinoff, the dollar had been particularly weak, and that gave investors in Philip Morris International hope that they'd actually outperform their domestic counterparts. Throughout the first six years of its existence as a separate publicly traded company, Philip Morris didn't see huge currency impacts. The dollar rose and fell, but it stayed in a relatively tight range as global macroeconomic conditions remained fairly consistent worldwide. That all changed in 2014, when the dollar began its huge rise to its current levels. In the second half of 2014, Philip Morris reported over $1 billion in adverse impacts on sales as a result of the dollar's strength, and it said that the currency weakness cost it nearly $0.50 per share in earnings as a result. 2015 was even worse, with the currency-related sales hit averaging about $1.2 billion per quarter and costing Philip Morris a total of $1.19 per share in lost earnings. In 2016, however, those negative impacts finally started to subside. The first quarter's negative impact amounted to almost $700 million in sales and $0.18 per share in earnings, but the second quarter's figures dropped to just over $300 million and $0.08 per share respectively. In its most recent quarter, the impact shrank even further, with Philip Morris reporting just a $0.04 amount of lost earnings from currency impacts and only $196 million in negative influence on its top line. The reason has been that the dollar's strength has plateaued throughout much of the year. The chart below shows the trend throughout 2016. With the dollar having stayed in a fairly tight range during 2016 compared to where it was in 2015, year-over-year impacts have almost disappeared. Is the dollar's strength over? 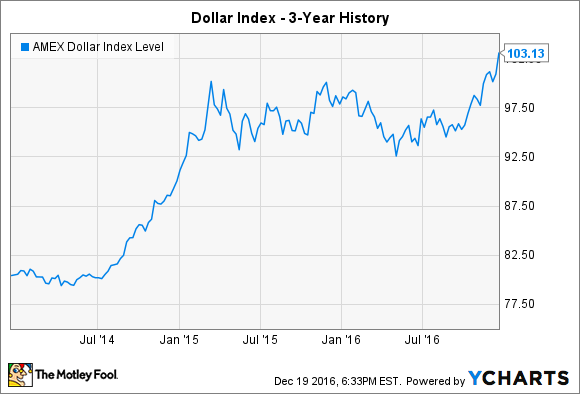 The only concern that some have is that since the election, the dollar has started to push higher again. The specter of higher interest rates in the U.S. stands out from the rest of the global economy, which continues to see sluggish economic conditions that warrant low rates and unattractive currency movements. If the recent upturn in the past month is the beginning of a new trend, then Philip Morris could see yet another round of earnings and revenue hits in 2017. Nevertheless, at least for 2016, Philip Morris scored a nice win from seeing currency-related headwinds start to fade. As long as the company continues to play to its fundamental strengths, then currency impacts should even out in the long run and leave investors satisfied with Philip Morris' long-term business performance.